This basic tutorial part 3 for beginners explains HTML web coding in an easy to understand way with the novice user at mind. A comprehensive tutorial with step by step instructions including full color screen shots in Word or PDF format enabling you to build your own basic web site by only using the Notepad editor. This tutorial will explain how to create a full functional web page for the world wide web and does require prior knowledge of basic web editing or web coding learned in the HTML Tutorial Part 1 and 2. The third part of this tutorial explains: How to create another web page and link it to your home page. The start of a little web site. How to use your own images and link them. Specifying color by Hexadecimal Code, List of useful html tags and more. It requires prior knowledge of basic web editing or web coding learned in the HTML Tutorial Part 1 and 2. 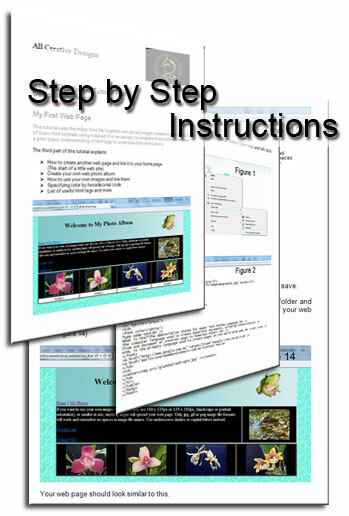 A comprehensive tutorial with step by step instructions with accompanying full color screenshots in Word or PDF format enabling you to build your own basic web site by only using the Notepad editor. Duration of this tutorial is approximately 1.5 to 2 hrs. Learn how to web optimize your photos in our Picasa Image Editing Tutorial ( Free Download From Google ) before you start this tutorial. An easy to follow HTML Tutorial for the beginner in Word or PDF format. If you can create a folder, save files and are able to copy and paste this tutorial is not difficult to complete.